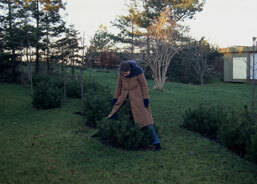 Wako Works of Art holds a curated show of work by Danish artists Nina Beier and Marie Lund. 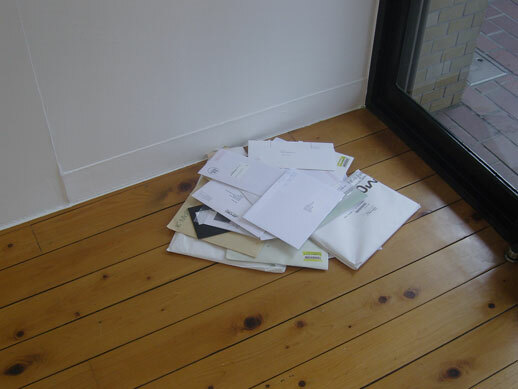 Nina Beier + Marie Lund "A Circular Play"
A pile of mail is strewn by the door; a dark grey worker’s carpet, rolled out and forgotten sits in the middle of the floor; and mismatching frames, seemingly empty, line the gallery walls. It’s no mistake that Wako Works of Art’s current show, Nina Beier and Marie Lund’s “A Circular Play”, looks like a work in progress. Curated by Mami Kataoka, senior curator at the Mori Art Museum, the two-room show gives objects a movement and life as they travel from conception to execution to dismantling. They exist not as static objects, but as objects that serve as a record for an entire history and carry with them a plotted out future. This story can be seen in the pile of mail by the door. The piece is called All The Best, and came with the instruction that “all mail sent to the gallery for the duration of the exhibition be left unopened by the door.” Toshie Fukasaku at Wako seemed only mildly disturbed that she wouldn’t be able to check their mail until July 19th when the show closes. Beier and Lund’s work uses audience members as their medium, relying on their imagination and curiosity to grasp the life of a piece. All the Best exists in the audience’s imagination: Given that a considerable pile of mail had already built up on the exhibition’s opening day, imagine poor Fukasaku-san catching up on a month’s worth (See here for an ongoing report on the growth of this work). Nina Beier and Marie Lund, both Danish, met at the Royal College of Art in London and begun collaborating in 2004. Their first book, Plans for Other Days, was a quirky set of instructional photographs created and realized with classmates from the Royal College of Art and published by Booth-Clibborn in 2005. Beier’s white blonde mane is omnipresent in the photographs, tied to the branches of a tree, or taking plants out for a walk. Now it is short and curly and she is always smiling. Lund appears less frequently in the book. In one photograph her hair is combed over her face. She is slight and attentive, choosing words carefully in her clear British accent. “Whatever they like” comes in the form of ten pieces, nine of which are being shown for the first time in Tokyo, after being conceptualized in a two-month residency at Tokyo Wonder Site. Beier and Lund drew on feelings of separation they felt in Japan, both being distant from their homes and more importantly, distant from Japanese society. The work on show at Wako isn’t a Japanese version of their what they would normally produce, but they were, Lund says, “quite indirectly inspired” by Japan. The pieces are imbued with a “sense of distance,” that came from their “persistent feeling of being an outsider, not completely understanding what it was that we were looking at.” She explains this “distance between understanding and meaning,” as central to their work. This distance is expressed in The Archives (World Peace). A quick glance might give you the impression that these mismatched frames are empty, but in fact they contain posters that have been carefully folded horizontally in two, so that you cannot see the image. Faintly, one can see the outline of political statements. Beier and Lund found peace posters that form invisible alliances—Finland supporting peace in Chile, Cuba for Korea, and so on. It had been their intent to create a political piece while in Japan, but struck by the difference in the Japanese way of expressing compared to their Danish extroversion, they came up with The Archives. It was this separation between what is said and what is meant that fascinated Beier and Lund. 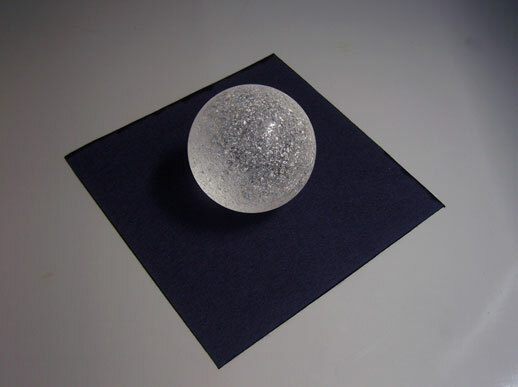 Beier says that through looking at the work of Mono-ha in Japan they saw that “the material surface of things had such a strong presence, but that the content was excised from things.” For History makes a Young Man Old, Beier and Lund bought a clear crystal ball from a Tokyo shop and rolled it through Yoyogi Park on an hour and a half journey that ended at Wako in Shinjuku. The ball is thoroughly scratched all over, impossible to see through. Again, the process behind the making is what fascinates Beier and Lund. Their objects have a past and future, often with explicit instructions for the buyers of such works. In their dice piece 42, Beier and Lund threw seven dice each, the faces of which added up to forty-two. 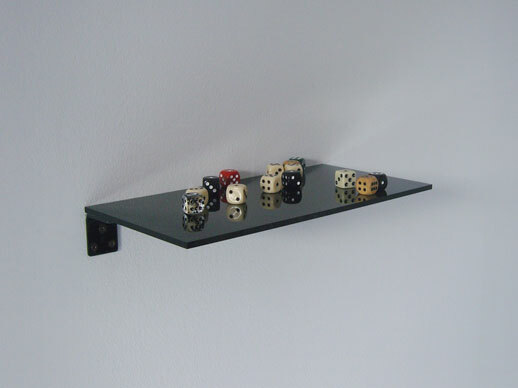 Any prospective buyers who wish to install this work in their home must agree to roll the dice themselves until the faces add up to forty-two. 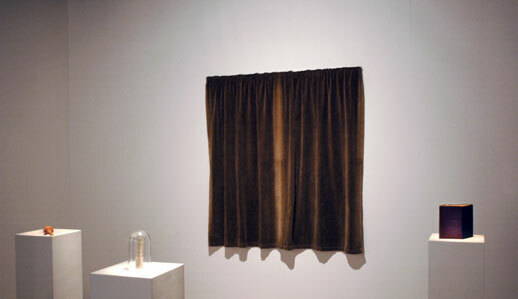 Kataoka explains this particular work as being a “record of what they do,” an object representing an entire process insisting to the viewer that their work is never “finished. The piece continues to change after the show’s closing. Beier and Lund say that their work is always created out of a moment of inspiration, which then turns into months of conversations and questioning, honing and defending the work to each other. When asked if their collaboration helps them push each other or support each other, both answered quickly, “Push.” Their work is thoughtful and drawn from the legacy of many artists from the 1960s. Kataoka mentions Yoko Ono’s instruction paintings, Lawrence Weiner and Vito Acconci. All three reference Mono-ha repeatedly, saying that they were inspired by their focus on materiality. In a way this is what the process of the entire show was like. 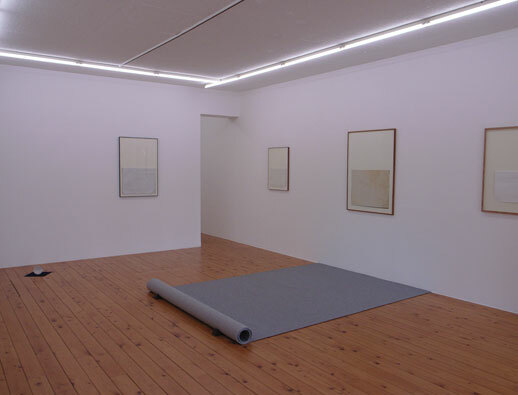 Beier says that they came to Kataoka with “bad little sketches and collages.” However, Kataoka trusted them completely, saying, “I don’t give guidelines to any artists”. Kataoka could see that they were constantly in dialogue and was excited to see what would emerge from it. While creating their pieces, the two showed in Korea and are already due to show at the ICA, Tate Modern and Gallery One One One in London. They have also been commissioned to show in Italy and in Vienna. For the exhibition at Gallery One One One they plan to start with a solo show of their own work before replacing their pieces one by one with conceptually related pieces by artists they admire, resulting in an unfixed, composite exhibition that metamorphoses according to their curatorial vision. While Kataoka says that “curating a show is like throwing a single stone into the big ocean of Tokyo,” she emphasizes the relevance and applicability of their work to a Japanese audience. She sees this kind of instructional art and participatory art as being increasingly important, because it pushes the boundaries of the Japanese audience’s understanding of conceptual art. Kataoka sees this show as a natural extension of her own goals of the last ten years, to become “more interested in the role of art and the role of ideas in society,” and take fresh new directions in the conversation. 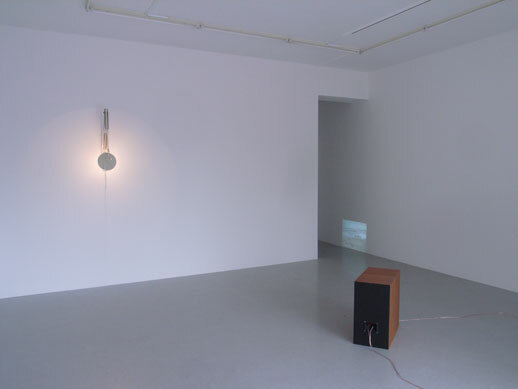 Beier and Lund say that they are always interested in “intervening with a given situation [or object] and seeing how things will move onward.” Through their collaboration, these three women are intervening with the Japanese art world, injecting process into static objects, humor into every day situations, and adding to a conversation-in-progress between society and art.